just returned from visiting some good friends in tucson arizona. in between bouts of poor behavior we headed south into the desert to the titan missile museum. amazing would be an understatement. easily one of the best tours i have ever been on. what we have done here is irreversible. there were no systems in place to stop the launch once it was initiated. after launch you would have one of two options. one would be to climb up the ladder within the air intake duct, and go topside to whiteness a world that could very possibly be unrecognizable to the one you once new. or two you could wait for communication from the outside world, and possibly die within twenty-five days from lack of oxygen, food, or water. all delivered in a cinematic-ly heavy voice. heavy to say the least, and i believe he followed it up with a great joke. if you find yourself out that way check it out. meanwhile here is the museums official site. 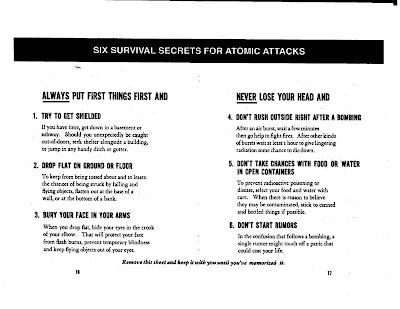 you can also read up on how to survive a blast here.